Packed in a rugged plastic storage case. 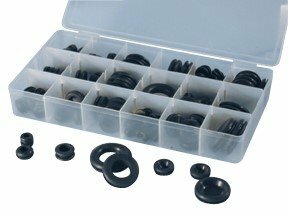 Assortment contains: (15) EWG-1 - 1/8" x 9/32". (10) EWG-6 - 3/16" x 5/16". (7) EWG-13 - 1/4" x 1/2". (3) EWG-21 - 5/16" x 17/32". (6) EWG-26 - 3/8" x 1/2". (5) EWG-27 - 3/8" x 9/16". (3) EWG-31 - 3/8" x 3/4". (3) EWG-34 - 7/16" x 3/4". (4) EWG-36 - 1/2" x 21/32". (3) EWG-44 - 5/8" x 1". (2) EWG-45 - 3/4" x 15/16". (20) RBG-1 - 5/16". (20) RBD-2 - 3/8". (10) RBG-3 - 1/2". (5) RBG-4 - 5/8". (4) RBG-5 - 3/4". (3) RBG-6 - 7/8". (2) RBG-7 - 1". If you have any questions about this product by ATD, contact us by completing and submitting the form below. If you are looking for a specif part number, please include it with your message.